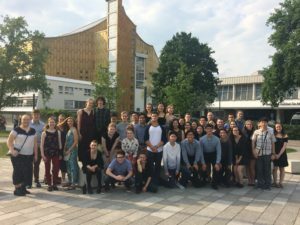 Today was Day 3 as part of the GTCYS Eastern Europe Tour with the Berlin Philharmonic filling our day’s events. 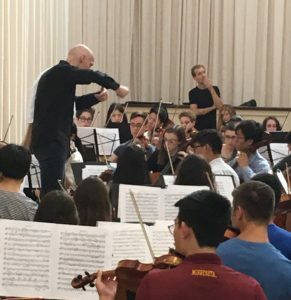 In the morning session, the symphony orchestra had the opportunity to work with Stephan Koncz, one of the 12 esteemed cellists of the Berlin Philharmonic, in a Berlin Philharmonic workshop. Madeline Sheard, a Symphony cellist, described the workshop with one word: “invigorating.” Energy flowing from anxiety, excitement, or finally getting to hold our instruments again filled the huge cattle auctioneer venue which was our rehearsal space for the morning. I personally heard the energy from diligent sounds of string players practicing fast passages like any string seating audition day. And it kind of was. An esteemed musician was coming to hear us play. The criticism or compliments we hear would be from whether or not each of us could step up to play the best that we can. For cellist Matthew Jeon, Mr.Koncz “gave us the opportunity to put together something great and give it our best shot as a group.” Seeing everyone’s energies come together during the run through showed the passion and care that we have for the music and for each other as well. Danke an alle. Mr. Koncz held an important role of exposing the orchestra with new perspectives on pieces we’ve had since the beginning of the school year. Mr. Koncz especially focused on Die Fledermaus for good reason. His Viennese descent made him well connected to the defining style of the emphasis on the downbeat and recurring motif of compressing the first two eighth notes in a two eighth-quarter-quarter. The compression of the eighth note was the work of practicing in rehearsal for months Maestro Smith’s interpretation. The suggestion of not emphasizing the eighth note compression emphasized the necessity of having many and certainly more than one interpretation of the same piece. Collaboration and compromise had to happen for both Maestro and Mr. Koncz to make us sound better. Maestro took some ideas with complete agreement. Other ideas he hesitated and silently shook off as unnecessary. Though not being the most typical masterclass I’ve seen, their interaction reminded graduate cellist, Kenny Peng, that “music is subjective and objective. There are things you have to have and there are things you can have your way with.” Danke Mr. Koncz für das Kommen. Mr. Koncz had positive comments to say about the GTCYS organization as a whole. He had been a part of a youth orchestra since he was 14. 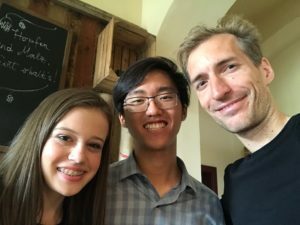 In his experience “it changed his outlook and his life.” Even as a part of a high-caliber orchestra such as Berlin Philharmonic, knowing that he gone through a similar youth orchestra experience is inspiring and unbelievable. Many of our GTCYS seniors are continuing to study music in college, working towards becoming a professional musician like him. Remembering successful idols such as Mr. Koncz will inspire them and all other students to pursue music with diligence, love, passion, and heart. He also reflected on his youth orchestra experience with envy on what great things that GTCYS had to offer. Many including me will have lasting memories of his workshop and the improvement that we had. Hopefully a few years later while I’m watching a new Berlin Philharmonic Youtube video, I can recognize him and feel happy that I had gotten the chance to work with him. Danke GTCYS. Tonight, we also heard the Berlin Philharmonic play in their gorgeous concert venue. After working with Mr. Koncz in the masterclass, Madeline Sheard, a cellist, “could not wait to see them play and move as one group.” Their performance was outstanding to say the least with works of Bernstein to Tom and Jerry which involved breaking plates. Mr. Koncz reminded us to madly cheer at the end of the performance. That we did. Danke Berliner Philharmoniker.